We have been swiftly blow into Autumn this year, so swiftly that I barely even realised that the clocks went back this weekend. Like most, I anticipated an extra hour in bed, however like half of my Twitter feed I, like many was awake at 7am, up and about and attempting to make my Sunday a productive one. 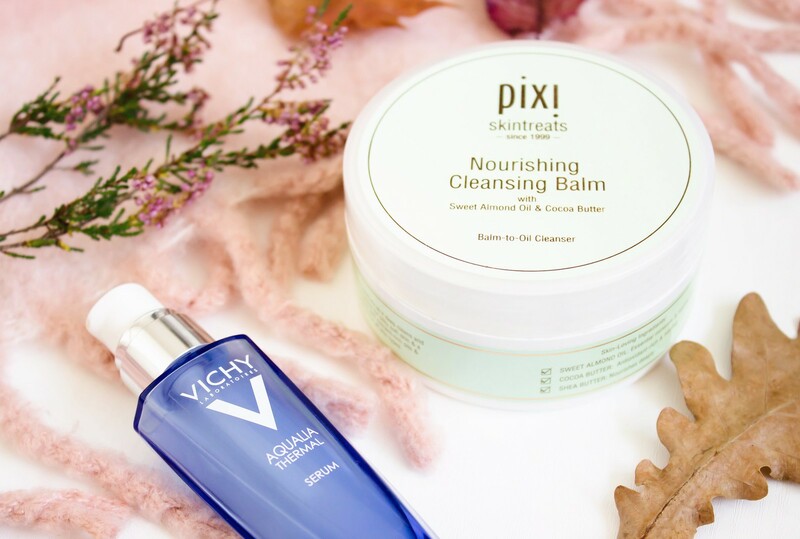 Over the weekend I came to the end of what has to be one of my top five favourite products from 2017, the Pixi Cleansing Balm*. It has been a wonderful product which I have thoroughly enjoyed using. 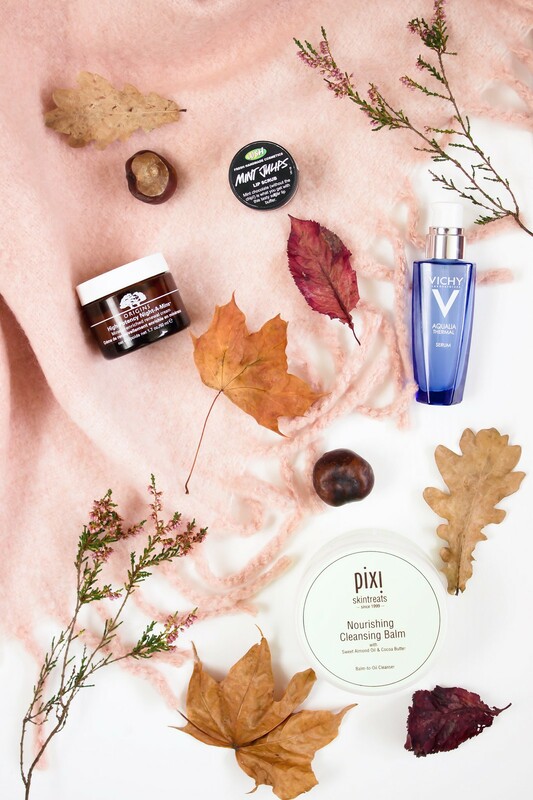 Therefore, I decided to bring it to you today along with some of my other favourite autumn and winter skincare products which I am loving and have been using steadily for a while. As mentioned above, I have loved using this product and could not recommend it more to anybody that will listen to me harp on about it. It is a hard balm in the tub, however as soon as the warmth of your skin meets the product then it becomes instantly easy to work with. It melts into your skin like butter, the texture becomes so smooth and breaks down make up perfectly. I find that this works really well on my skin and does not leave it feeling greasy at all, in fact it is left hydrated, soothed and clean. I always do double cleanse if I have been wearing makeup, which if I am honest is most of the time. I would always recommend using a flannel with this due to the oily balm texture, it would be quite hard to remove with just warm water and your hands alone; use the flannel. I have taken the liberty of linking to my original review of this back in April 2014 *gulp* if you wish to read more about it from when I very first purchased it (I do note that it has increased in price during that time). My thoughts on this remain the same even three years later, I still think it is an awesome night cream which continues to leave my skin looking and feeling hydrated and re-charged in the morning. Incidentally, the scent of this is perfection to me, it is quite fruity which I guess is slightly odd for a night cream however it personally works for me and I happily welcome that element of it. It is strange when writing about this product in particular, the reason being that when I first started blogging this was such a popular product; however it is rare that I see it crop up these days. I do often feel like a very old school blogger at times, I often do stick to what I know I like; this just happens to be one of those products that I come back to again and again. This is a new product to me this year which I had put off buying for a little while. In hindsight that was a foolish decision because this is utterly fantastic, I have since already purchased a backup. This is aimed at women who have sensitive skin, however I personally do not claim to have particularly sensitive skin that I have to be too concerned with, although it can have its moments. That being said, it is not something that sways my decision when purchasing products. If you have dehydrated skin (like me) that is also combination/oily then I really do suggest taking a look at this and reading up on it more. It is light weight, soothing, calming and nourishing and really does help combat dehydration. Of course, with the colder months I always struggle with dry lips. I have yet to find an amazing lip balm which really does help to combat this long term, although a shout out to Lanolips is worthwhile. Therefore I try as much as possible to incorporate a lip scrub into my routine, in order to help combat the dryness and to remove dead skin cells. In the past, I have used the bubble gum flavour lip scrub from LUSH which is so nice, if somewhat deadly as you end up licking it off despite how gross that may sound. The most recent choice has been the mint julips which I also really like and do recommend giving it a try. The only thing I would add is that I would not be tempted to use this daily as it can make your lips sore if you use it too much, the sugar particles can be quite rough. 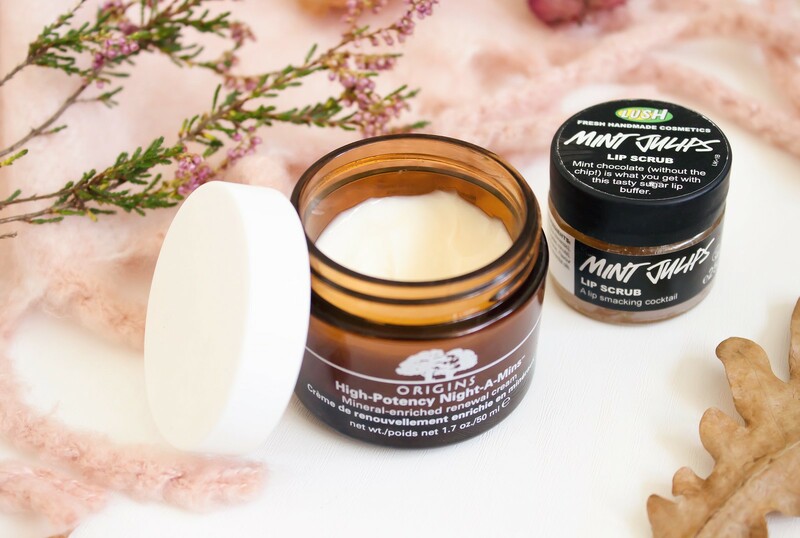 What are your top skincare products for the colder months?